pgAdmin is the most popular and feature rich Open Source administration and development platform for PostgreSQL, the most advanced Open Source database in the world. 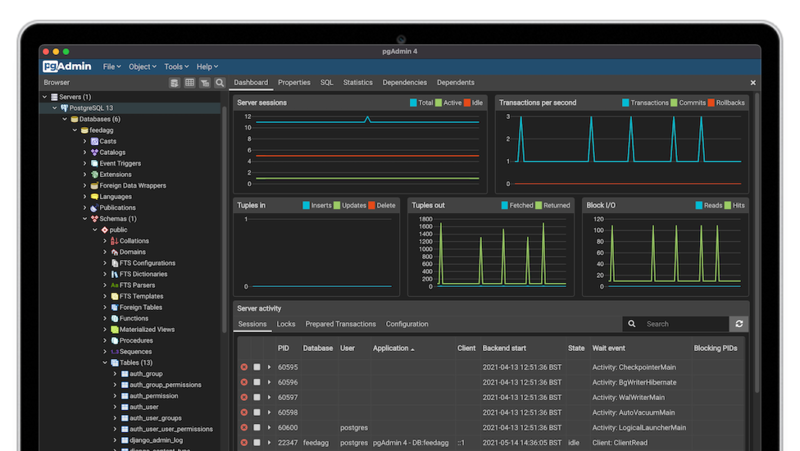 pgAdmin may be used on Linux, Unix, Mac OS X and Windows to manage PostgreSQL 9.2 and above. The pgAdmin Development Team are pleased to announce pgAdmin 4 version 4.5. This release of pgAdmin 4 includes over 5 bug fixes. For more details please see the release notes here. Ensure that pgAdmin4 should work properly with psycopg2 v2.8. Fixed 'Change Password' issue for SCRAM authentication. Ensure that two consecutive SELECT statements should work properly. Relabel the Save button on the datagrid text editor to avoid confusion with the actual Save button that updates the database. The pgAdmin Development Team are pleased to announce pgAdmin 4 version 4.4. This release of pgAdmin 4 includes over 35 bug fixes and new features. For more details please see the release notes here. Warning: This release includes a bug fix which will rename the per-user storage directories for existing users when running in server mode. Previously, saved SQL queries were stored under the STORAGE_DIR in a sub-directory named after the username part of the user’s email address. From this version onwards, the full email address is used, with the @ replaced with an underscore. The pgAdmin Development Team are pleased to announce pgAdmin 4 version 4.3. This release of pgAdmin 4 includes over 38 bug fixes and new features. For more details please see the release notes here. Add a "scratch pad" to the Query Tool to hold text snippets whilst editing. Add Commit and Rollback buttons to the Query Tool. Automatically expand child nodes as well as the selected node on the treeview if there is only one. Include multiple versions of the PG utilties in containers. Update Alpine Linux version in the docker container. Support double-click on Query Tool result grid column resize handles to auto-size to the content. Allow X-FRAME-OPTIONS to be set for security. Default to SAMEORIGIN. Install a script to start pgAdmin (pgadmin4) from the command line when installed from the Python wheel. Close connections gracefully when the user logs out of pgAdmin. The pgAdmin Development Team are pleased to announce pgAdmin 4 version 4.2. This release of pgAdmin 4 includes over 40 bug fixes. For more details please see the release notes here. The pgAdmin Development Team are pleased to announce pgAdmin 4 version 4.1. This release of pgAdmin 4 includes over 7 bug fixes. For more details please see the release notes here. The pgAdmin Development Team are pleased to announce pgAdmin 4 version 4.0. This release of pgAdmin 4 includes over 26 bug fixes and new features. For more details please see the release notes here. The pgAdmin Development Team are pleased to announce pgAdmin 4 version 3.6. This release of pgAdmin 4 includes over 10 bug fixes and new features. For more details please see the release notes here. Note: This is the first release of pgAdmin on a new monthly release cycle. Add support for dropping multiple objects at once from the collection Properties panel. Add the ability to import and export server definitions from a config database. The pgAdmin Development Team are pleased to announce pgAdmin 4 version 3.5. This release of pgAdmin 4 includes over 11 bug fixes and new features. For more details please see the release notes here. Migrate from Bootstrap 3 to Bootstrap 4. Save the treeview state periodically, and restore it automatically when reconnecting. Support to stop the utility processes (Backup/Restore/Maintenance...). The pgAdmin Development Team are pleased to announce pgAdmin 4 version 3.4. This release of pgAdmin 4 includes over 11 bug fixes and new features. For more details please see the release notes here. Add shortcuts for View Data and the Query tool to the Browser header bar. Add optional data point markers and mouse-over tooltips to display values on graphs. Ensure the runtime can startup properly if there are wide characters in the account/user name on Windows. The pgAdmin Development Team are pleased to announce the release of pgAgent v4.0.0. pgAgent is a job scheduler for PostgreSQL; for more information please see the documentation included as part of the pgAdmin documentation at https://www.pgadmin.org/docs/pgadmin4/3.x/pgagent.html. We expect DEB and RPM packages to be available from the PostgreSQL APT/YUM repositories in due course, as well as an updated installer from EnterpriseDB available through StackBuilder.